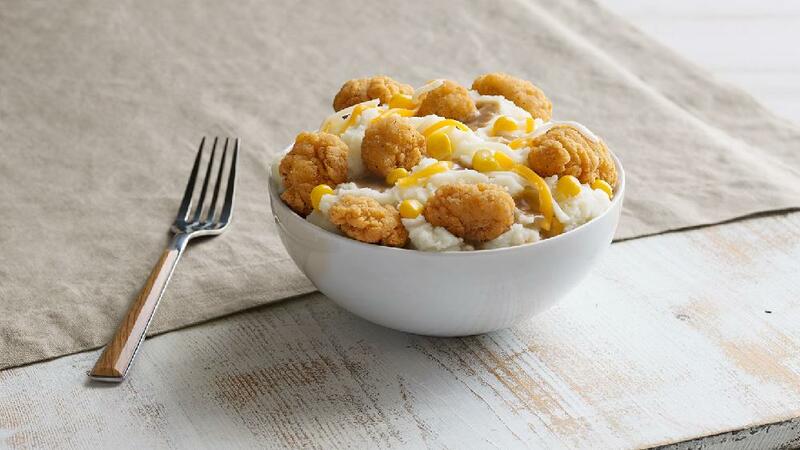 Quick and easy comfort meal with chicken, mashed potatoes, corn, gravy, and topped with cheese, just like the Colonel fixes! Preheat oven to 350°. Place mashed potatoes and corn in separate oven-proof containers. Place in oven for 20-30 minutes, until hot. Add the chicken after 10 minutes. Watch the chicken so it doesn't get overdone and dried out. Meanwhile, heat leftover gravy in saucepan. Cut chicken into bite-size chunks. Layer mashed potatoes, corn, and chicken, respectively, into individual serving bowls. Sprinkle with cheese and top with gravy.